Julie Andrews sings about raindrops on roses and whiskers on kittens in a great musical called "The Sound of Music," (classic. must watch.) and it got me thinking about all of your favorites. So, I sat you down with me, and we compiled a list of things that rock your world. January 5th, 2013 - Three Years Old. I have to admit, some of your answers took me a bit by surprise. For example, your favorite thing to do with Daddy? I fully expected the answer to have something to do with Ham Radio. And your favorite sport? I was so getting ready to type basketball when you blurted out tennis. Then there were the answers that I could have given in my sleep. Favorite color, favorite instrument and favorite restaurant were all spot on with what I expected. That dang favorite restaurant. Golden Corral. It has a lot to do with your obsession with what they call the Chocolate Wonderfall. It's this chocolate fountain that, quite honestly, turns Mommy's stomach. You never get more than one strawberry dipped in it, and I think it's more the novelty of watching it thrills you, but it totally rocks your little world. The attached picture makes me laugh. It was created by Daddy's friend Mike (K4ICY) from Ham Radio stuff, which you also like to do with Daddy, for the TARS group. 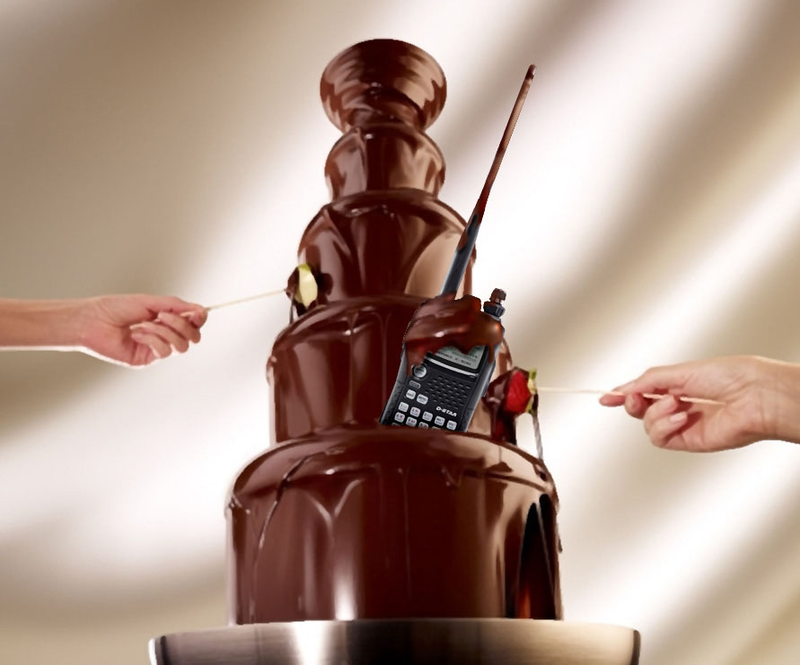 They all meet at Golden Corral for meetings, so I am waiting for the day when you decide that you want to join so you can go with them to enjoy radio geekery and the Chocolate Wonderfall. Your universe will implode from all the awesomeness. And here's a blast from my past: This blog post reminded me of Slam Books. Any readers out there remember those? It was a notebook, and on every page there was a heading and each line was numbered. Friends would pick a number on page one, and then on the following pages, they would answer the question or topic on their number. They were passed from friend to friend, and usually filled out when we were supposed to be paying attention in class. But since it was in a notebook, as long as the teacher didn't wander the aisles of desks, no adults were the wiser. They were a ton of fun, until someone realized that someone else answered the same "who's your crush" question with the same name as them. Lord. Middle school drama. How awesome. It's crazy to think that not that long ago, that was the thing that caused strife in life. Not mortgage payments or trying to get your kid into a good preschool. Ahh, the simpler times in life. Well, now I've totally digressed from the point of this blog post, which was to capture your loves and favorites at this point in your life. I hope that one day you will look back and see what used to thrill your little self. And maybe some of them, like Iron Maiden being your favorite band, will not have changed. One thing's for sure: I will always love you!